Mac & cheese (or pasta with some sort of creamy cheesy sauce) is a staple at our house and one that the kids love. 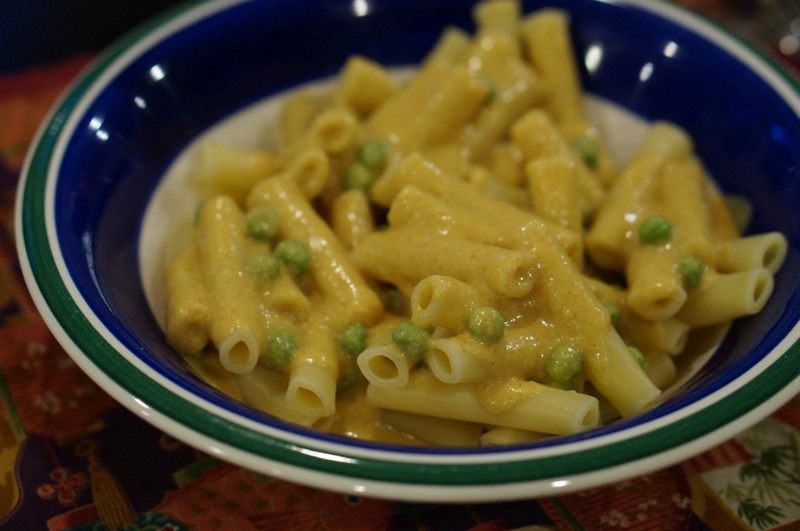 An old standby (pictured above) is the “Cheezee Sauce” recipe from Robin Robertson’s Vegan on the Cheap. It’s quick to make and we usually add some peas or frozen spinach and pour it over pasta – a quick weeknight meal. For this, just add 2/3 c. nutritional yeast, 3 Tbs. cornstarch, 1 1/4 tsp. salt and 1/2 tsp. garlic powder to a saucepan. Whisk in 2 c. water or plain unsweetened soy milk and cook over medium heat, stirring frequently, until thickened. Then stir in 1 Tbs. olive oil, 2 tsp. lemon juice, 2 tsp. cider vinegar and 1 tsp. mustard. 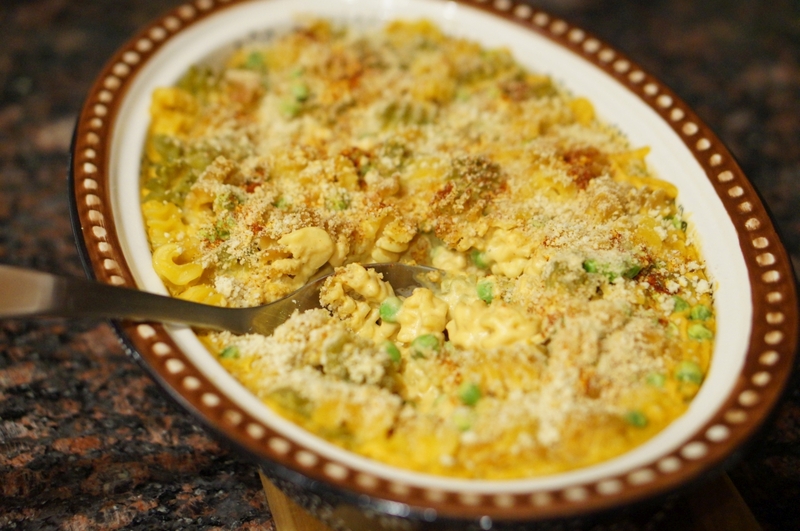 Another Robin Robertson recipe we just tried recently was the Butternut Mac and Cheese from Vegan Without Borders. This ups the nutrition with the addition of cashews and butternut squash. It’s slightly more involved because it requires a blender and it has to bake for a short time but it still came together quickly and was quite delicious. I encourage you to give one of these a try or find your own favorite. Many vegan cookbooks have a faux cheese sauce recipe, or just Google “vegan mac and cheese” and you’re sure to find many options from which to choose.